I get a lot of emails but I get only a few that I really enjoy. One type that falls into the “enjoy” category is when one of you beautiful readers sends me a gem of a recipe that they’ve tried out with great success. These are my favorite emails in the world for a few reasons. First, it’s awesome that people think of me when they come up with a tasty dish. Second, it means I can reproduce it and share it with everybody else! 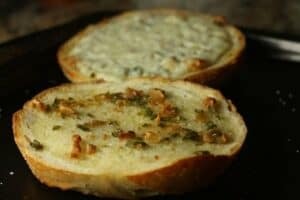 Spicy Garlic Bread is a simple and delicious spin on the standard version from a Macheesmo reader and friend. 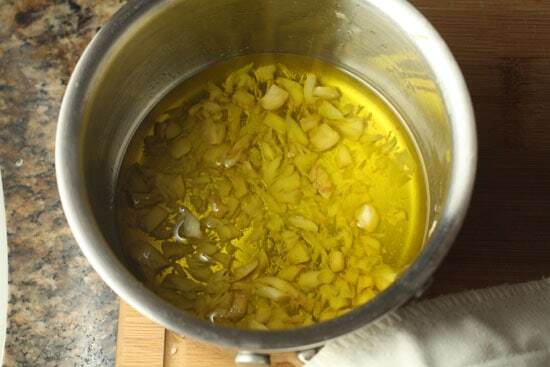 1) Peel garlic cloves and roughly chop them, then add them to a small oven-safe saucepan or a ramekin and bake at 300 for about 20 minutes. Check it regularly to make sure the garlic doesn’t burn. You can also just cook this on low on the stove top for a few minutes until the garlic is tender. 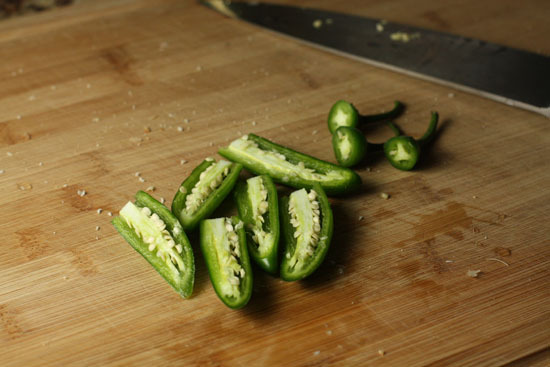 2) Meanwhile chop up a few Serrano or jalapeno peppers. If you leave the seeds in, you’ll end up with a spicier bread. 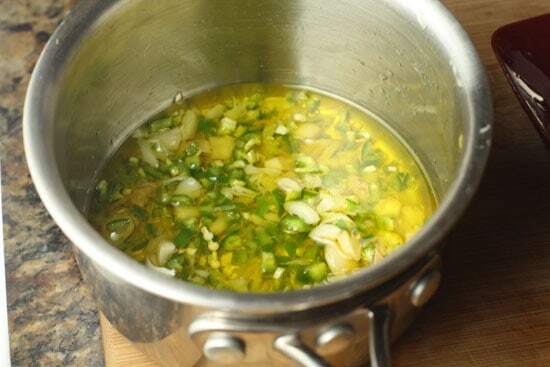 3) When the garlic is done, mush it with a fork and add your peppers to the oil mixture. Set this over low heat on the stove or just return it to the oven. Cook for another few minutes until it’s very fragrant, but not browned. 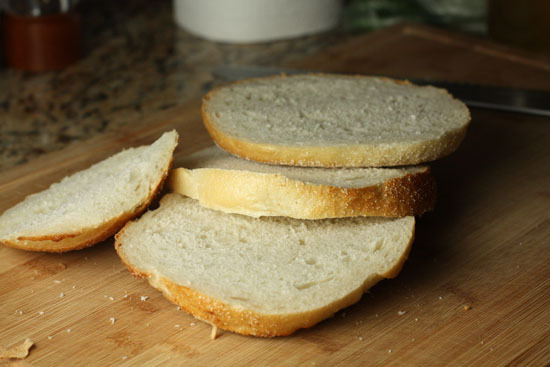 4) Slice some sturdy bread into 4 thick slices. 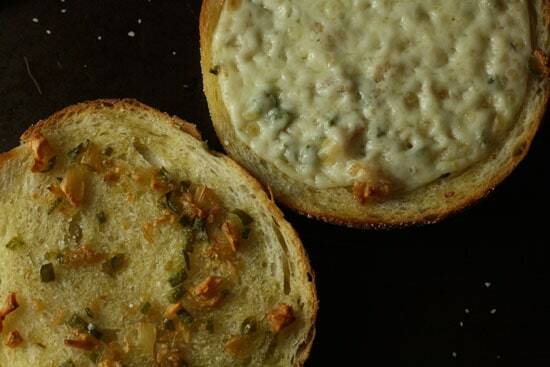 5) Spoon garlic and pepper mixture on bread and drizzle on oil. 6) Bake at 400 degrees for 5-8 minutes until crispy and slightly browned on top. I really do have a hard time following instructions sometimes. I didn’t use jalapeno peppers, but Serrano. I’m not sure that it matters either way. I also didn’t bake them in a ramekin but in a small saucepan that I could move from the oven to the stove. I don’t know if my version was improved but it was very good. Peel the garlic but leave the cloves pretty whole. You can roughly chop them if you want. Then add them to an oven-safe saucepan or ramekin and almost cover them with olive oil. You’ll probably need about 1/4-1/3 of a cup of olive oil. Stick this in the oven on 300 for about 15-20 minutes (you might need more time with a ramekin). Keep an eye on it though so the garlic doesn’t burn. The low heat should work fine for that amount of time. 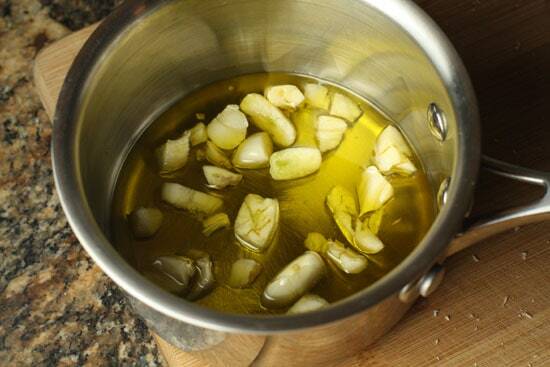 Your goal here is to soften the garlic and infuse the oil but not really brown the garlic. Meanwhile you can chop up some peppers! Ok. I didn’t use all of these because I wussed out. I started with 3 Serranos, but then I quickly pared it down to two. In hindsight, I might have kept it at 3 since I like really spicy stuff. Two was the perfect level of spicy though for most people I think. When I had one bite it wasn’t exactly spicy, but the spice would kick in slowly after a few bites which is great. I diced mine up seeds and all. If you want to lessen the heat, cut out the seeds and white pulp before you dice them up. When the garlic oil comes out of the oven (careful it’s hot), the cloves should be soft enough to mush up roughly with a fork. So, ya know, mush them with a fork. Then add in all your chopped peppers. This will be pretty fragrant. I wouldn’t recommend inhaling deeply over this small pan. It’s potent stuff right now. 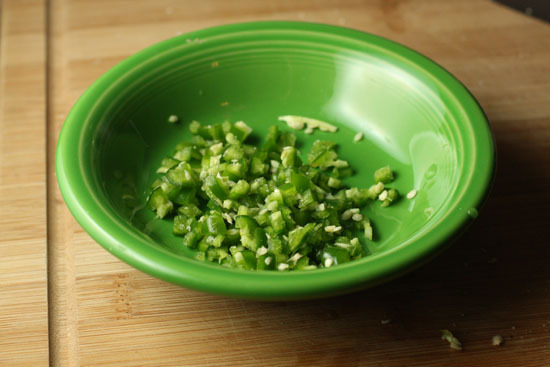 If you have a stove-safe pan, add it over a low heat and stir for a few minutes until the peppers are soft. Again, you don’t necessarily want them really brown. If you don’t have something you can move from oven to stove, I think you could also just put this back in the oven for a few minutes and it should do the trick. As an alternative, I think you could just use the stove top for this. Just cook the garlic on low heat until it’s tender, then add the peppers and continue cooking on low. 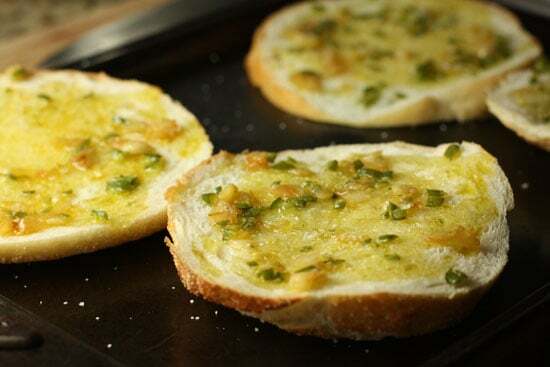 One important thing about all garlic breads, but definitely this one, is to use really sturdy bread. Wonder bread simply will not do. I used a good sourdough bread and sliced it pretty thick. Nice and thick is good here. Lay these slices out on a baking sheet and then, once your oil mixture is done cooking for a few minutes, slather each piece of bread with some of the oil mixture. To make sure I had an even distribution, I spooned out the garlic and peppers and spread that on the bread, then drizzled on some of the oil over each piece. I didn’t use all of the oil, but almost. Then crank up your oven to 450 and bake these slices for about 5-8 minutes until they are nice and browned on top. I tried something experimental with a few of my slices and added some provolone cheese to the bread. I’m iffy on the cheese. Strangely, and you will almost never hear this from me, I liked the non-cheese version better! I know I’ve made garlic bread two days in a row now, but I think that’s okay because garlic bread is an important subject. And this version is a great twist on the classic. Jean, rocks! What a great idea! Thanks for posting. I may make this soon! Thanks for posting this. It's amazing what can happen when you grab what's in front of you. My mom's husband Buck does this when he makes garlic bread (well, we call it Buck bread), but just nukes the crushed garlic in olive oil. It gives the bread a much nicer, roasted garlic flavor, rather than raw. Peppers are a great idea! Hi Nick! I made Jean's Garlic Bread 2nite and it rocked! Three simple little letter best describe the taste and sensation… O-M-G! I, like you, chose to use some quality Italian sharp provolone that I had purchased from Costco last night. Unbelievable! Again… Thanks and keep on doing that magic that you do (and sharing it with the rest of us)! OMGosh!! I am officially hungry now :) This looks so good and I will for sure have to try it using some homemade Kamut Wheat bread!! Perfect combo, thanks!